1. If you have had an Internet Service unchanged in 6 months or longer than you are likely over paying for your service, sometimes these costs are dramatically more than they should be. 2. Also worse you would have data usage that might go over your usage allowance, incurring excess charges that are very high, or degradation of service. This overcharging can be hundreds of dollars per month (not per year per month). With more and more videos and music in the cloud for us to download, or upload, the world is downloading and uploading more than ever. In Australia we are no different but most are over paying for their Internet sometimes dramatically for years. Actually greed and the refusal to think outside the box by the Internet Service Providers, from a market perspective. The problem has been ongoing for years but the overcharging was worsened in September 2010. At the time the wholesale cost of Internet dramatically reduced. Internet Service providers big and small Telstra, Optus TPG, iiNet, etc. all faced the problem of how to maintain profits and revenue. When this happened to in the UK (I was working for British Telecom at the time), this actually put some smaller (and not very good) Internet providers out of business. I did some research on how you could offer existing customers lower prices proactively, and increase revenue as well, the US and UK adopted that pricing model, Australia did not. The result of this is the monthly charge of the Home Broadband Internet Service you bought 1 year ago has not changed but what you get for itis a fraction of what a new customer would get for the same price today. ‘It is like going to get fuel and there are no prices advertised, as everyone gets a different price for the same fuel depending when they signed their contract’. Yet many Australians have not spent the 30 minutes it takes to sometimes save 50% or more by knowing what service they have, and adjusting their bandwidth appropriately. This means in most cases being able to call your existing supplier and letting them know from their website that new customers are paying less for their new service, than I am paying as an existing customer, can I please have my bandwidth upgraded to the current rate, or move to a new service etc. Most Internet providers will be happy to do this if you hint you prefer not to shop around. 1. The amount of bandwidth you are using is more than your allowance was a year ago. 2. You might not be using all your data allowance so the plan you have is right, or you bought a new plan in the last 6 months, then you might be fine. 2. Go to the website of your current Internet Provider, or call them if you have to, and see what the comparable product is today. 3. Phone your ISP and get that lower price. 4. Check a website like Whirlpool.net and see what broadband services you can get in your area from others. Your ISP might be overcharging everyone. 3. Greed – Let’s face it if consumers are happy (or blinded) to not know the right questions to ask, then why lower your prices. 1. Smoke and Mirrors – The Internet is a commodity like gas or electric (and just as important for many of us), yet ISPs still make it a bit confusing when ordering a service. If you know what you want then it is easier, if you need advice, it is sometimes so forthcoming. If you know what you want but the ISP has a better deal they might not always offer it as it might not be the most profitable service they they offer. If you have incurred any excess charges for your Internet service and again you have had a service unchanged for some time, then the lack of proactivity by your Internet Provider could have meant you paid higher prices as a result, sometimes twice as much as you regular rent. Example 2: By friend in on an Internet Service that charges excess (pay as you go) when you exceed your otherwise allowed usage). These charges have been a lot, and going on for some time. On further review it turns out a new service would have a huge difference in the data allowed, but because the customer does not know this and their ISP Telstra did not tell them they could upgrade for free, the result was the customer having regular $200 and $400 in over charges bills for a $60 per month service. Here Telstra failed to disclose to the customer by not being upfront on pricing, that the customer could upgrade for free and save $200-$400 per month in excess charges also to Telstra. I suggested a pert call to Telstra on this lack of Duty of Disclosure Issue before sending a letter to the Ombudsman, Telstra was happy to change the plan and credit the yet unpaid $400 in excess fees. Recently is was reported that many Australians are planning to look at changing Telcos in 2012. It was recently reported that only 16% of Australians will move or upgrade their mobile phone plans, due to the perceived complexity of doing so. The excess customers are paying on their mobile service is often a fraction of what they are being over charged for their home Internet connections. Moving an Internet Connection can be more complicated as with mobile phones you can often keep your number, with home Internet consumers lose their email address from their ISP, this requires a lot more preparation, ahead of time like moving all their Email to gmail or their own domain name so the loss of their ISP email address is transparent. This is not widely known, so ISPs will often use this to get customers to stay, almost bullying them into staying. If all of this is true (it is) then surely the Australian Government would act ? Hmm, This seemed obvious to me, if you are being overcharged or have a complaint, about Internet Services then the ACCC will act. Recently they acted against one of the few ISPs actually doing a good job and that is TPG. TPG offers unlimited Internet Services for $29.99 per month (plus a $30 phone), or $59.99 per month without (the same price either way). The ACCC took exception to TPG as they were not being as upfront about the phone cost. Silly really. So I raised a complaint to the ACCC about the ACCC on this (more to prove the point and raise the issue formally). My point was simple they investigate singular acts of consumer problems what about the widespread fact that most customers do not know they are getting over charged then paying for these over charges with yes more overcharges. The ACCC was clear on this, (and very polite) they do not regulate an industry,specfically on their web site here they say The ACCC does not regulate voluntary industry codes of conduct, only individual complaints. I understand I worked closely with OFCOM, in the United Kingdom for the better part of a decade on these same issues. OFCOM did try to regulate an industry and not very well. However, some folks did not overcharge the customer the way Australians are being over charged. If nothing else the ACCC should add this information to their website, on this page for instance . But I think it needs a show like a current affair to look at this as it is so blatant and a topic they covered recently on mobile phones that is nothing compared to this. The Drama of Living in an Australian Fibre ‘Only’ Connected Community. I recently spent some time helping a friend of mine build a new house in Melbourne. At the end of it all came managing the telecommunications aspect (my specialty). The bottom line of it all was this. A new community of hundreds of homes, the developer in Point Cook, Melbourne chose Opticom vs. Telstra to provide connectivity for IPTV including Internet. The hypothetical upside is the whole area has fibre. The downside, the whole area has no copper; the fibre is managed by the developer that has set themselves up as ISP and they are offering a high price for a poor product (they are contending the product so the product is the same as DSL but at 400% of the price). This means they are offering 12mb for $200 per month with 100GB download. I currently pay $60 for unlimited download via TPG. Calls to try and get any copper or alternative seem to be fruitless thus far. The next route, includes local MP, and Telstra might be able to offer help via thorough cost analysis, and then it might be down to a class action law suit, not just in Melbourne but nationally, a mess at best. So will it be any different with the NBN. I spoke to them recently with all of this in mind, they were vague but my understanding (needs to be verified) is it could happen again if another developer was to do what this developer did with Opticom. The developer said the only role Opticom apparently had here was offering an infrastructure, where Telstra refused. I suggested to the developer that they are trying to get their money out of their investment (customers) too fast, not the right sort of ROI. This is falling on deaf ears so far. With the launch of iPads outside of the USA on the 28th of May, carriers around the globe had plenty of time to manage their networks, set-up processes, and customer service. Unfortunately it appears at least one infamous International carrier has already buckled in a form that is reminiscent of the USA’s AT&T. I speak of course of Telstra Australia. 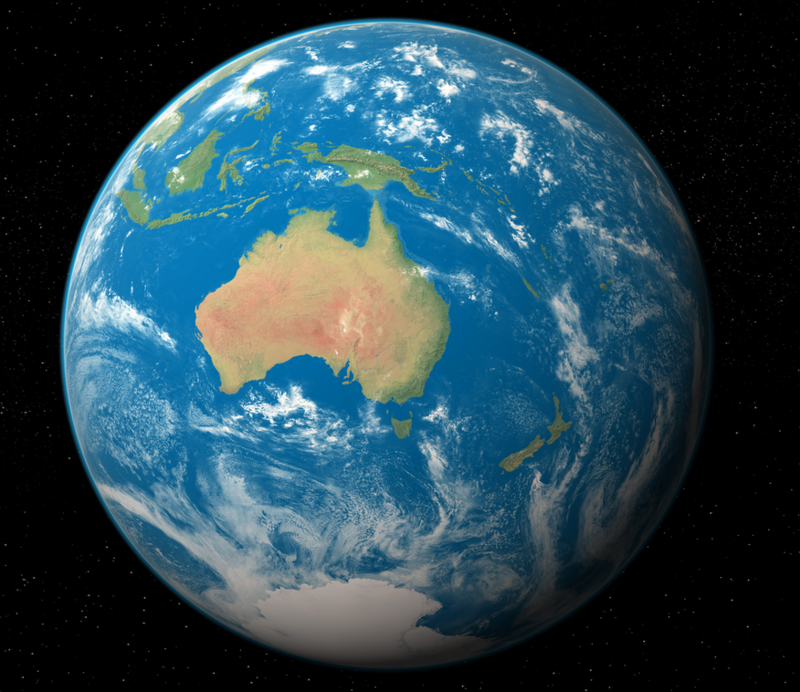 Australia almost the exact size the USA but with population of Holland, has been punished for years by a non-privatized part government owned incumbent telecommunications company. The monopolistic carrier failed miserably to handle the anticipated numbers of prepaid sims they provided to the apple stores. The iPads could be set-up as well as the carrier Telstra unfortunately the Telstra data connection set-up systems have failed preventing scores of folks from being able to connect to the Internet. 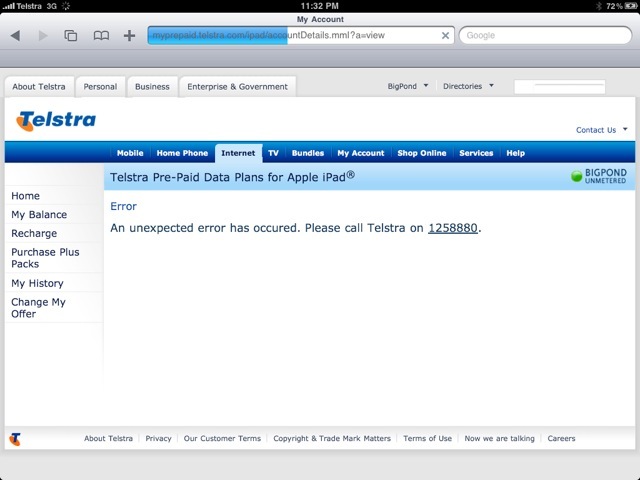 People calling Telstra have spent hours on the phone to resolve the issue only to have Telstra cut customers off or tell them it is an Apple iPad issue. However, it has quickly shown up in support forums around the world to actually be a Telstra training issue. There appears to be no immediate fix in site and new iPad users are naturally frustrated. The biggest issue is that consumers will be confused that they have can have 5 bars on their iPad, but the iPad service (data) has not been activated, though the instructions mention it. Why the data and the carrier service could not be activated on line via iTunes, amazes me, and why apple staff could not tell you (when you buy the sim from them), that you will get 5 bars of service but still need to activate the sim also amazes me. Only 72 hours and after 6 attempts, and holding for 10 minutes the last time, (after holding for 2 hours previously) after buying the 3G iPad, I have been able to activate my iPad data plan. I was told it would then take 2 hours for the activation to take place. The telstra call centre in the Phillipines was very nice and at least they stay on the phone with the user whilst the systems activate the sim. This took 10 minutes, but I have to think there has to be a better way.